To create email template, go to Personal Setup | Email | My Templates and click on New Template. In type of Email template, we can select HTML, HTML with Letter Head , Visual force or without letter Head. Text – All users can create or change text email templates. See Creating Text Email Templates. HTML with letterhead – Administrators and users with the “Edit HTML Templates” permission can create HTML email templates based on a letterhead. See Creating HTML Email Templates. Custom HTML – Administrators and users with the “Edit HTML Templates” permission can create custom HTML email templates without using a letterhead. You must either know HTML or obtain the HTML code to insert in your email template. See Creating Custom HTML Email Templates. Visualforce – Administrators and developers can create templates using Visualforce. Visualforce email templates allow for advanced merging with a recipient’s data, where the content of a template can contain information from multiple records, see Creating Visualforce Email Templates. All of these email templates can include text, merge fields, and attached files. You can also include images on your HTML and Visualforce templates. You can use email templates when you send an email from the Activity History related list of a record. Text and HTML templates can also be used when you send mass email. A button to check the spelling of your template is available for text templates andVisualforce templates without HTML tags. Note : You cannot send a mass email using a Visualforce email template. As, you can see in above screen shot that Creating email template is very easy, you can use Object fields as a place holder. 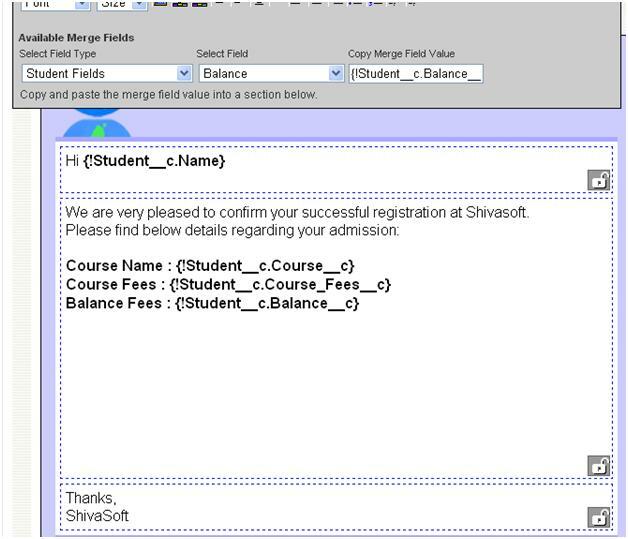 In above email, Student name, Course , fees and Balance is Place holder which will be replaced on runtime. To manage your personal email templates, click Setup | Email | My Templates. If you have permission to manage public email templates, click Setup | Communication Templates | Email Templates. Click on the name of any email template to go to the Viewing Email Templates page. To edit or delete a template, click Edit or Del next to the template name in the list. Click New Template to create any type of email template. There are, however, key points to remember in order to come up with more effective designs for email-templates. go to setup and then to lead and then to web to lead. Is there a way to send an email with custom fields to customers to fill out and send back to SF? You cannot send any script or something in Email as it is not allowed and also mark SPAM. I am not able to post a screen shot. You want screen shot of the preview?